Atlassian today announced a new version of Confluence, its collaboration platform. 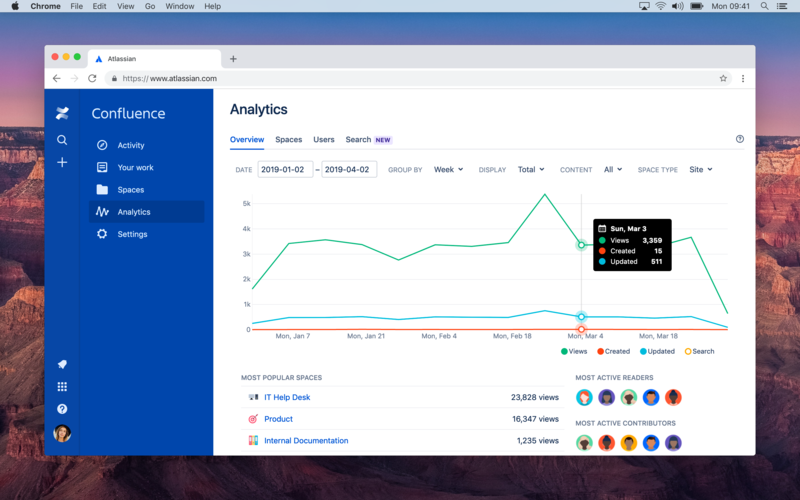 While the company has recently focused more on tools like Jira, Bitbucket and Trello, Confluence has continued to gain traction as a content collaboration tool for technical and non-technical teams. Indeed, even though it’s been quiet around it, it’s the second-most revenue-generating product for Atlassian right now. With this release, Atlassian is once again putting the spotlight on Confluence. To do this, Atlassian also today announced that it has acquired Good Software, a company that makes analytics tools for Confluence users and admins. In total, Atlassian is announcing 15 new features for the product. Unsurprisingly, given the acquisition of Good Software, one of these new features is extended analytics. With this, Confluence users will be able to see how others in their company engage with their content. The idea here, Atlassian says, is to help everybody write better content and not just see who writes the most popular copy (though that’s surely how this will also be used). There are some other uses here, too, though. An HR manager may notice that a page with outdated information is still getting hits, for example. Over time, Atlassian will integrate these features more deeply into the rest of Confluence. Another major new feature is the introduction of an updated editor. The core features of this new editor are actually shared across most Atlassian products now, but as Pratima Arora, the company’s head of Confluence, told me, that editor is then tweaked for the individual products. For Confluence, this means support for the ever-important feature of adding emojis to your pages, but at the core of that is the new slash (/) command that, similar to Slack, lets you add tables, images and macros to your pages. Other new features include the ability to easily create better-looking tables of content, action items, roadmaps and due dates, as well as smartlinks that automatically preview content for services like Google Drive, Dropbox, Trello, GitHub and others. All of this is meant to make organizing content just a little bit easier. Also new are a set of new templates and a new media experience.